Is Windows 10 Software NIC Teaming now possible? Windows Server 2012 brought with it NIC teaming of adapters by different manufacturers. It didn't make it onto Windows 8/8.1. I've seen some article where people reported it was working on Windows 10 Preview but no longer working. Is NIC Teaming supported on Windows 10 Pro? Or another edition. This has been disabled in the most recent version of Windows 10 as well as the insider build 14295. The powershell command will error out or say that LBFO is not supported on the current SKU depending on the versin of Windows you are running. Hopefully MS will re-enable this feature sometime soon. I haven't found a way to access this though a GUI, but running the following PowerShell command will create a team for you. Just replace the Ethernet names with your NIC names. You should then get a 2GBs Switch Independent team. From there you can use the Network Connections screen to set it up how you want. No it is not possible to get NIC teamin in Windows 10 client SKUs. But available for Server SKUs. "There are no native LBFO capabilities on Win10. Microsoft does not support client SKU network teaming. In the 14393 update (“Anniversary update”), we continued blocking it, but improved the error message." Intel mentions teaming support for Windows 10 in driver versions 22.3 or newer. Currently 23.5 is available. This version comes with ANS (advanced network services, installed by default) which should allow teaming via powershell commands. I havent tried it yet - the only mainboard I have with two intel nic's is a bit bios upgrade stubborn. PS C:\Windows\system32> Import-Module -Name "C:\Program Files\Intel\Wired Networking\IntelNetCmdlets\IntelNetCmdlets"
Not the answer you're looking for? Browse other questions tagged networking windows-10 bonding or ask your own question. TCP load balancing with multiple IP addresses possible? 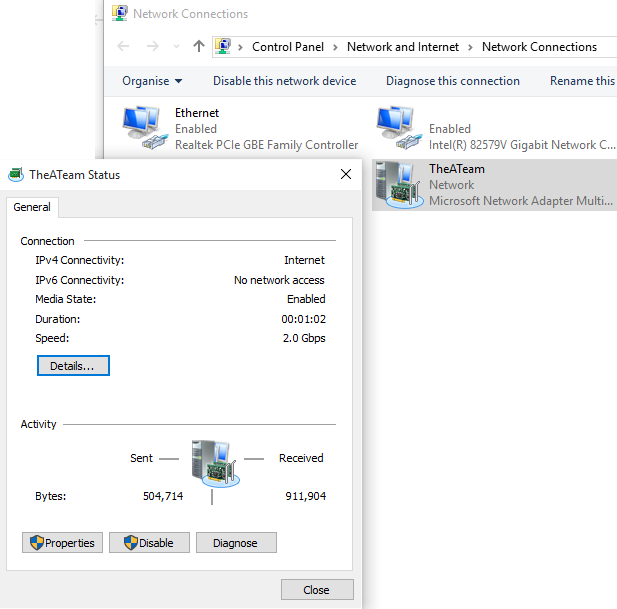 Intel gigabit ethernet teaming - Which option should I pick, and how do I get it working?